The ability to inhibit drinking is a significant challenge for recovering alcoholics, especially in the presence of alcohol-associated cues. Previous studies have demonstrated that the regulation of cue-guided alcohol seeking is mediated by the basolateral amygdala (BLA), nucleus accumbens (NAc), and medial prefrontal cortex (mPFC). However, given the high interconnectivity between these structures, it is unclear how mPFC projections to each subcortical structure, as well as projections between BLA and NAc, mediate alcohol-seeking behaviors. Here, we evaluate how cortico-striatal, cortico-amygdalar, and amygdalo-striatal projections control extinction and relapse in a rat model of alcohol seeking. Specifically, we used a combinatorial viral technique to express diphtheria toxin receptors in specific neuron populations based on their projection targets. We then used this strategy to create directionally selective ablations of three distinct pathways after acquisition of ethanol self-administration but before extinction and reinstatement. We demonstrate that ablation of mPFC neurons projecting to NAc, but not BLA, blocks cue-induced reinstatement of alcohol seeking and neither pathway is necessary for extinction of responding. Further, we show that ablating BLA neurons that project to NAc disrupts extinction of alcohol approach behaviors and attenuates reinstatement. 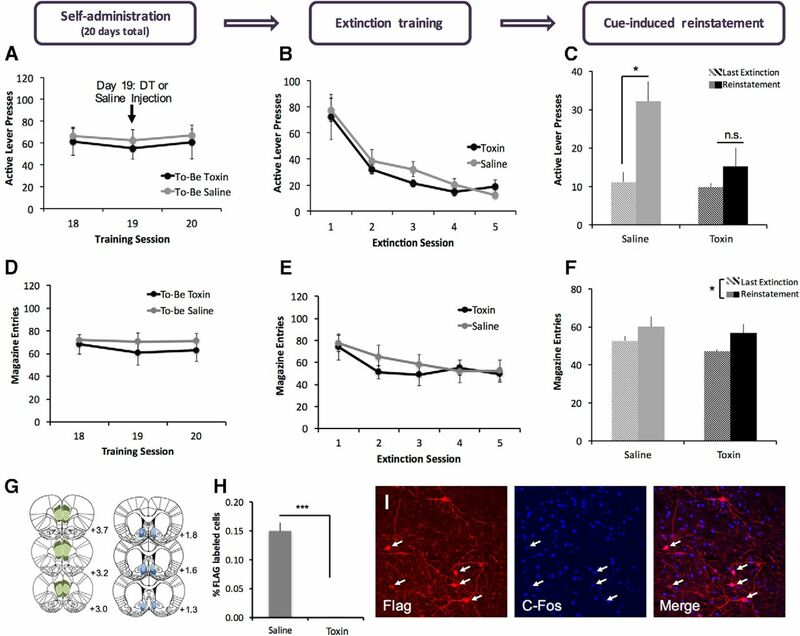 Together, these data provide evidence that the mPFC→NAc pathway is necessary for cue-induced reinstatement of alcohol seeking, expand our understanding of how the BLA→NAc pathway regulates alcohol behavior, and introduce a new methodology for the manipulation of target-specific neural projections. SIGNIFICANCE STATEMENT The vast majority of recovering alcoholics will relapse at least once and understanding how the brain regulates relapse will be key to developing more effective behavior and pharmacological therapies for alcoholism. Given the high interconnectivity of cortical, striatal, and limbic structures that regulate alcohol intake, it has been difficult to disentangle how separate projections between them may control different aspects of these complex behaviors. Here, we demonstrate a new approach for noninvasively ablating each of these pathways and testing their necessity for both extinction and relapse. We show that inputs to the nucleus accumbens from medial prefrontal cortex and amygdala regulate alcohol-seeking behaviors differentially, adding to our understanding of the neural control of alcoholism. Alcohol is the most widely used drug (Substance Abuse and Mental Health Services Administration, 2014) and alcohol use disorders place a significant burden on public health and economies worldwide. Like other drug addictions, alcoholism is considered a chronic relapsing disease that is characterized by an inability to control drinking (Koob and Volkow, 2010). Relapse to alcohol use can be driven by a variety of factors, including the presence of environmental or sensory cues that were previously paired with alcohol intake. These relapse events depend on associative learning processes whereby cues paired with a positive reinforcer such as alcohol gain the ability to trigger cravings and motivate behaviors to obtain that reinforcer (Weiss, 2005; Heinz et al., 2009; Bossert et al., 2013). In both recovering alcoholics and rodent models of intake, cue-triggered relapse can occur even after instrumental processes have been extinguished (Ciccocioppo et al., 2001; Field and Duka, 2002; Lê and Shaham, 2002; Sinha and Li, 2007). Developing more effective behavioral and pharmacological treatments for alcoholism will require a better understanding of the neural circuitry that underlies both extinction and cue-triggered relapse to alcohol intake. Previous studies have shown that cue-induced alcohol seeking depends on the activity of limbic-striatal structures, especially basolateral amygdala (BLA) and nucleus accumbens (NAc) (Chaudhri et al., 2010; Sinclair et al., 2012; Millan et al., 2015; Sciascia et al., 2015), and that alcohol seeking is correlated with increased glutamatergic transmission in these structures (Gass et al., 2011). It is also known that alcohol-paired cues induce activity in mPFC (Dayas et al., 2007; Koob and Volkow, 2010) and alcohol seeking can be perpetuated by alterations in medial prefrontal cortex (mPFC) (Weiss, 2005; Heinz et al., 2009; Abernathy et al., 2010). Although it is thought that the loss of behavioral regulation in addiction results from dysfunction in mesocorticolimbic circuitry (Jentsch and Taylor, 1999; Ciccocioppo et al., 2001; Field and Duka, 2002; Sinha and Li, 2007), how specific afferents in these pathways control cue-triggered alcohol seeking, especially in the early stages of alcohol intake, is still unclear. Given the high interconnectivity of neural circuits, traditional methods such as lesions and inactivation have been unable to identify the role of specific projections among mPFC, NAc, and BLA. Here, we used a novel approach to ablate directionally specific subpopulations of mPFC neurons defined by their projection target. To accomplish this, we combined a retrogradely transported Cre virus with a floxed diphtheria toxin receptor (DTR)-encoding virus. By expressing floxed DTR in the mPFC and infusing retrograde Cre virus into either NAc or BLA, DTRs are expressed selectively in mPFC neurons projecting to either of these subcortical structures. Because rodents do not express DTR endogenously (Coca et al., 1921; Middlebrook and Dorland, 1977; Naglich and Eidels, 1990), only the targeted pathway is subject to ablation via systemic injection of diphtheria toxin (DT). We used this system to test separately the necessity of the mPFC→NAc, mPFC→BLA, and BLA→NAc pathways in the extinction and reinstatement of alcohol seeking. Our data reveal three key findings: (1) the mPFC→NAc pathway is necessary for cue-induced reinstatement, but not extinction, of alcohol seeking; (2) the mPFC→BLA pathway is not necessary for extinction or reinstatement of alcohol seeking; and (3) the BLA→NAc pathway is necessary for the extinction of approach behavior and regulates the reinstatement of alcohol seeking. Together, these data provide insight into the role of specific circuits in the regulation of alcohol-related behaviors. Experimentally naive male Sprague Dawley rats (Charles River Laboratories, RRID: RGD_737891) were housed in pairs on a 12:12 h light/dark cycle in a temperature- and humidity-controlled environment. Rats weighed 225–275 g upon arrival and were acclimated to the housing facility for 1 week before surgery. Rats were allowed to recover from surgery before being food restricted to 90–92% of their free-feeding weights. All surgical and behavioral procedures were approved by the Yale University Institutional Animal Care and Use Committee and were consistent with the National Institutes of Health's Guidelines on the Care and Use of Laboratory Animals. Surgeries were performed at least 1 week before the start of self-administration training. Rats were anesthetized with 75 mg/kg ketamine + 10 mg/kg xylazine (i.m.) and mounted on a stereotaxic frame. For both mPFC→NAc and mPFC→BLA ablations, AAV6.2.CMV.PI.Cre.rBG [UPenn Vector Core; lot CS0164-TC; titer = 2.34e13 genomic copies (gc)/ml)] was infused into either NAc (AP +1.5, ML 0.85, DV −7.6) or BLA (AP −2.8, ML 5.0, DV −8.7/8.4; half-volume at each site). AAV6 was infused at a volume of 0.5 μl over a 10 min period and allowed to diffuse for 5 min after injection. AAVrh10 CAG.EGFP.FLEX.DTRFLAG.WPRE.pA (described in Xu et al., 2016; A46, titer= ∼1013 gc/ml) was injected bilaterally into mPFC (AP +3.0, ML 0.4, DV −4.0) at a volume of 0.25 μl. AAVrh10-DTR was injected at 0.05 μl/min and allowed to diffuse for 10 min. For the BLA→NAc experiments, AAV6-Cre was injected into NAc (same volume and rates given above) and AAVrh10-DIO-DTR was injected into BLA (0.2 μl/side, DV: −8.7). See Figure 1A for a summary. All viral injections were performed with 0.5 μl Hamilton syringes with 25 gauge needles. All alcohol-seeking experiments were conducted in standard Med Associates operant chambers (30 × 20 × 25 cm) enclosed in sound- and light-attenuating cabinets. Each chamber contained a metal rod floor, house light, clicking noise generator, and two retractable levers on either side of a recessed magazine chamber. A motorized dipper arm delivered 0.1 ml of the ethanol/saccharin solution into the magazine port and head entries were detected by a photocell mounted inside the reinforcer receptacle. After surgery, animals were allowed to recover for 5 d and were then food restricted to 90–92% of their free-feeding body weight. Before beginning behavioral training, animals underwent 2 d of preexposure to the alcohol/saccharin solution to prevent neophobia. Each day, animals were left in their home cages but moved to a new room where they no longer had access to water and were allowed to eat freely for 15 min. Bottles containing 10% ethanol + 0.1% saccharin were then placed on the wire cage tops and rats were allowed to sample the solution for 60–90 min. The volume of solution consumed was recorded and animals were returned to the colony. After 2 d of preexposure, animals were introduced to the behavioral training chambers. Training began with one magazine session to orient the animals with the location of reward delivery. During this session, 61 dippers were delivered on a fixed interval 25 s schedule and the dipper arm remained raised for 10 s. Starting the next day, rats received daily sessions in which both levers were extended and they learned to press one (“active lever”) for delivery of the alcohol reinforcer on a fixed ratio 1 (FR1) schedule. The dipper arm remained raised for 10 s and, during this time, the house light flashed at 1 Hz and 3 clicks were presented. The sessions terminated when an animal had administered 30 dipper deliveries of alcohol or after 60 min had passed. After reaching behavioral criteria of ≥20 dipper deliveries in a single session, each animal received 19 d of FR1 training. All subjects consistently administered 30 dippers per day, resulting in total daily delivery of 3 ml of 10% ethanol. Animals were then randomly assigned to receive intraperitoneal injection of either DT (30 μg/kg) or saline (1 ml/kg) immediately after the 19th session and received one additional day of alcohol self-administration. The time point for injection was chosen based on previous studies showing robust and long-lasting effects on both behavior and cellular markers of apoptosis at 48 h after DT injection (Gropp et al., 2005; Han et al., 2009). By injecting 48 h before the first extinction session, we therefore tested the effects of circuit ablation on both extinction and reinstatement. Immediately after day 20 of self-administration, animals underwent daily 15 min extinction sessions for 5–6 d or until responding had reached <25% of baseline (calculated as average lever pressing during the last 3 d of self-administration). During extinction, levers were extended and the house light was illuminated, but lever presses were no longer consequential and resulted in neither alcohol nor audiovisual cue delivery. The ethanol + saccharin solution was left in the chamber throughout extinction but was inaccessible to the rat. The next day, animals were put back in the chambers and underwent a 15 min cue-induced reinstatement test. Immediately after the session initiated, they were exposed to one “free” noncontingent presentation of the alcohol-paired audiovisual cue. Subsequently, every response on the active lever resulted in presentation of the cue but not alcohol delivery. Animals were deeply anesthetized with euthasol and perfused transcardially with chilled saline followed by 10% formalin. Brains were postfixed for 24 h then transferred to 30% w/v sucrose for 2–7 d before slicing. 35 Micrometer sections were washed 3 × 5 min in 1× PBS, blocked in 3% normal donkey serum/0.3% Triton-X/PBS for 60 min, and then incubated overnight in blocking solution containing primary monocolonal antibodies directed toward FLAG (1:1000; Cell Signaling Technology 2368S; RRID:AB_2217020), Cre (1:500; Millipore MAB3120; RRID:AB_2085748), or c-Fos (1:500; Santa Cruz Biotechnology sc-52; RRID:AB_2629503). Slices were next washed 3 × 5 min in 1× PBS and incubated for 2 h with species-appropriate Alexa Fluor 555-conjugated secondary antibodies (Abcam, 1:500). Slices were washed 3 × 3 min in 1× PBS, mounted on slides, and coverslipped with Vectashield hard set mounting medium (Vector Laboratories). Apoptosis was evaluated with an antibody directed toward cleaved caspase-3 (Asp175; 1:5000; Cell Signaling Technology 9661S; RRID:AB_2341188) using a similar protocol as above except that slices were blocked for 120 min and both primary and secondary antibodies were diluted in buffer (1% BSA/0.3% Triton X-100). Slides were investigated using an Olympus fluorescent-equipped upright mounted microscope (with 5×, 10×, and 20× objectives) and a Fluoview FV10i confocal microscope (with 10× and 20× objectives). Quantification was performed using the particle analysis function in ImageJ to count the number of stained nuclei in a 1.8 mm2 area within mPFC. Percentage FLAG+ expression was calculated as the number of FLAG+ cells divided by the total number of fluorescent cells (GFP+ and FLAG+). Data are expressed as mean ± SEM. All data were analyzed with the IMB SPSS Statistics package, version 23, using either t tests or repeated-measures ANOVAs (rm-ANOVAs). The criterion for statistical significance was a probability level of p < 0.05. For behavioral analyses, the between-subjects factor was treatment (DT or saline) and the within-subject factor was training day. We combined a floxed DTR construct with a retrogradely transported AAV6-Cre virus to express DTRs in directionally specific neuronal projections. We first targeted the mPFC→NAc pathway (Fig. 1A), allowed 2 weeks for vial expression, and then systemically injected animals with saline, 15 μg/kg DT, or 30 μg/kg DT. Three weeks later, animals were perfused and slices from mPFC were stained with a FLAG-directed antibody. We found two populations of cells: GFP-expressing, Cre-negative neurons and DTR-FLAG-expressing, Cre-positive neurons (shown as green and red, respectively, in Fig. 1B). DT injection resulted in a dose-dependent reduction in total FLAG+ cells (one-way ANOVA: F(2,11) = 38.100, p < 0.001; post hoc Tukey tests p ≤ 0.015 for all comparisons) and percentage of FLAG+ cells (Fig. 1B,C; F(2,11) = 24.638, p < 0.001; post hoc Tukey tests p ≤ 0.018 for all comparisons), with no difference between treatment groups in GFP expression (F(2,11) = 2.491, p = 0.138). Cre labeling in the NAc shows that AAV-6 expression is restricted to the NAc, with expression in both dorsal shell and mediodorsal core regions (Fig. 1D). Strategy for target-specific ablation of mPFC afferents. A, AAVrh10-DIO-DTR-FLAG was infused into the mPFC and AAV6-Cre was infused in either the NAc (to target the mPFC→NAc pathway) or the BLA (to target the mPFC→BLA pathway). B, Representative micrographs taken after targeting the mPFC→NAc pathway. Scale bar, 100 μm. C, Immunohistochemical staining with a FLAG-directed antibody (red) shows a dose-dependent reduction in the percentage of total fluorescent cells that are FLAG+ after intraperitoneal injection of diphtheria toxin. (n = 4 saline, n = 4 15 μg/kg, and n = 4 30 μg/kg; ***p < 0.001, **p < 0.01) D, Cre-directed antibody showing local expression of AAV-Cre in the NAc shell and medial core. Scale bars 300 μm. E, F, Cleaved caspase-3 staining 48 h after injection revealed an increased expression of this apoptosis marker in DT versus saline-treated animals. (n = 3 saline, n = 3 DT; *p < 0.05). Previous work in DTR-expressing mouse models has shown that apoptosis markers are upregulated 48 h after DT injection (Han et al., 2009) and that DT-induced neuronal ablation has measurable behavioral effects as early as 24 h after injection (Gropp et al., 2005). To ensure a similar apoptosis time course in our model, we killed a separate group of rats 48 h after DT or saline injection and stained for cleaved caspase-3. We then quantified cleaved caspase-3 expression and found a significant upregulation in toxin-treated animals (Fig. 1F). 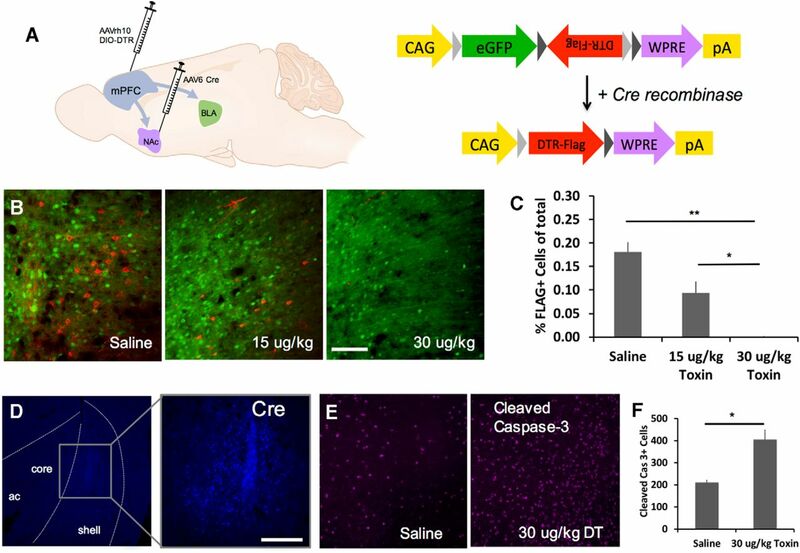 Qualitative analysis revealed similar cleaved caspase-3 expression levels in off-target regions (motor cortex and cingulate), suggesting that differences were localized to areas of DTR-FLAG expression. Before injection of saline or toxin, all animals were trained to self-administer alcohol on an FR1 schedule. As expected, rmANOVA revealed that both groups of animals increased their lever pressing across the 20 d of training (n = 6/group; main effect of day, F(19,209) = 3.014, p < 0.001) with no significant difference between those rats that would receive saline and those that would receive toxin (effect of future treatment F(1,11) = 1.419, p = 0.295, future treatment × day F(19,209) = 0.421, p = 0.985). Immediately after the completion of self-administration, animals began extinction training, during which presses on the active lever were recorded but did not result in delivery of alcohol or alcohol-paired cues. rmANOVA of lever pressing during extinction training revealed that both saline- and DT-treated animals decreased lever pressing over the course of extinction (Fig. 2B; main effect of day: F(4,40) = 21.334, p < 0.001), with no effect of treatment (F(1,10) = 0.748, p = 0.407) and no treatment by day interaction (F(4,40) = 0.372, p = 0.827). Similarly, both groups extinguished magazine entries with no effect of treatment or interaction between day and treatment (Fig. 2E; effect of day: F(4,40) = 4.451, p = 0.005; treatment: F(1,10) = 0.302, p = 0.594; day × treatment: F(1,10) = 0.249, p = 0.629). These results suggest that ablation of mPFC neurons projecting to NAc does not affect acquisition of extinction of alcohol seeking. Ablation of NAc-projecting mPFC neurons does not affect extinction but blocks cue-induced reinstatement of lever pressing for alcohol seeking. Animals were injected with viruses to target the mPFC→NAc pathway as described in Figure 1 and then trained to self-administer alcohol on an FR1 schedule. A, Final 3 d of self-administration showing equal levels of responding for both groups. B, C, Circuit ablation did not affect extinction training (B), but blocked cue-induced reinstatement of lever pressing (C) in toxin-treated animals (n = 6/group; *p < 0.05). (All extinction and reinstatement sessions were 15 min.) D–F, Circuit ablation did not affect magazine entry during extinction training or the reinstatement test. G, Schematic representation of viral spread in mPFC (DIO-DTR-FLAG) and NAc (Cre), with smallest (light colors) and largest (dark colors) acceptable spread shown. H, Toxin administration dramatically reduced the percentage of FLAG-labeled cells in mPFC. I, 10× confocal images of the mPFC of a rat killed 90 min after cue-induced reinstatement showing that Flag+ neurons are also c-Fos+, confirming that DTR expression does not interfere with neuronal activity as measured by c-Fos activity. After extinction training, animals underwent a cue-induced reinstatement test. For each group (saline- and toxin-treated), lever pressing during the last extinction session was compared with lever pressing during the reinstatement test to evaluate the ability of alcohol-paired cues to reinstate alcohol seeking. rmANOVA revealed a main effect of session (Fig. 2C; F(1,10) = 14.699, p = 0.003) and a trend toward a main effect of treatment (F(1,10) = 4.687, p = 0.056), with a significant treatment by session interaction (F(1,10) = 5.203, p = 0.046). Subsequent paired-sample t tests revealed that saline-treated animals showed a significant increase in responding during the cue-induced reinstatement test versus the last extinction session (t(5) = −3.860, p = 0.012), but toxin-treated animals did not (t(5) = −1.272, p = 0.259). Similar rmANOVA analyses revealed no effect of treatment on reinstatement of magazine entries (Fig. 2F; effect of session: F(1,9) = 5.358, p = 0.046; effect of treatment n.s. : F(1,9) = 0.478, p = 0.507; session × treatment interaction n.s. : F(1,9) = 0.016, p = 0.902). These results suggest that the mPFC→NAc pathway is necessary for cue-induced reinstatement of lever pressing for alcohol. A similar methodology was used to test the effects of ablating mPFC neurons projecting to BLA on both extinction and reinstatement of alcohol seeking. rmANOVA revealed that all animals acquired self-administration of alcohol (days 18–20 shown in Fig. 3A; effect of day: F(19,228) = 2.339, p = 0.002), with no effect of future treatment (saline or DT, n = 7/group; effect of group n.s. : F(1,12) = 2.634, p = 0.131; day × group interaction n.s. : F(19,228) = 1.011, p = 0.449). After saline or DT administration, both groups of animals reduced lever pressing over the course of extinction training (Fig. 3B; effect of day: F(4,48) = 45.029, p < 0.001), with no effect of treatment (F(1,12) = 1.565, p = 0.235) or day × treatment interaction (F(4,48) = 1.994, p = 0.110). Similarly, there was no effect of treatment on the extinction of magazine entries (Fig. 3E; effect of day: F(4,48) = 21.113, p < 0.001; effect of treatment n.s. : F(1,12) = 0.180, p = 0.679; treatment × day interaction n.s. : F(4,48) = 1.285, p = 0.289). After reaching extinction criteria, animals were subjected to a cue-induced reinstatement test as described above. Both saline- and toxin-treated animals showed reinstatement of lever pressing in response to cues (Fig. 3C; main effect of session: F(1,12) = 51.071, p < 0.001; effect of treatment n.s. : F(1,12) = 0.287, p = 0.602; session × treatment interaction n.s. : F(1,12) = 0.001, p = 0.976). Similarly, there was no effect of treatment on reinstatement of magazine entry (Fig. 3F; main effect of session: F(1,12) = 6.695, p = 0.024; effect of treatment n.s. : F(1,12) = 0.808, p = 0.386; session × treatment n.s. : F(1,12) = 0.143, p = 0.712). Immunohistochemical methods were used to confirm expression of DTR-FLAG and Cre (Fig. 3G,H) and to characterize the extent of viral spread (Fig. 3I). In the BLA, Cre expression was typically strongest ∼AP −2.8 and extended anteriorly to ∼AP −1.8 and posteriorly to ∼AP −3.5. DT administration reduced the percentage of FLAG expression (Fig. 3J; t(13) = 7.686, p < 0.001) and total FLAG+ cell count (saline mean = 19.7, DT mean = 1.5; t(13) = 8.363, p < 0.001) significantly, with no difference in GFP expression (saline mean = 168.1, DT mean = 142.8; t(13) = 0.188). Ablation of BLA-projecting mPFC neurons does not affect extinction or reinstatement. 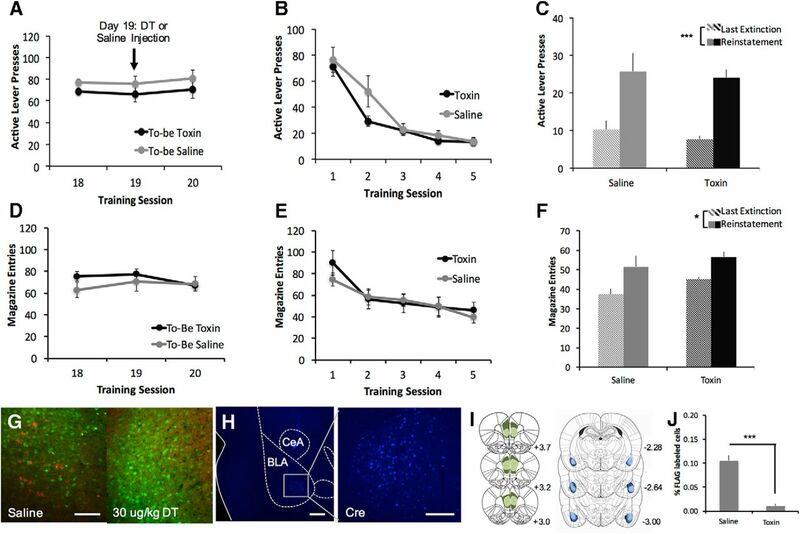 Surgeries were performed to induce expression of DTR-FLAG in the mPFC→BLA pathway and then rats were trained on a similar set of behavior tasks. A, We found no difference between groups before or immediately after saline/toxin injection. B, C, Both saline- and toxin-treated animals reduced lever pressing during extinction (B) and showed a reinstatement of responding (C) after exposure to alcohol-paired cues. D–F, Similarly, there was no difference between groups on extinction or reinstatement of magazine entries. G, Representative micrographs from the mPFC showing FLAG-labeled neurons (red) expressing DTR after saline treatment, but none after toxin treatment. Scale bar, 100 μm. H, Cre staining of local AAV6-Cre expression in BLA. Scale bars, 300 μm. I, Extent of viral spread in mPFC (DIO-DTR-FLAG) and BLA (Cre). J, Reduction in percentage of FLAG+ cells in toxin-treated versus saline-treated animals. (n = 7/group; *p < 0.05; ***p < 0.001). To assess the selective contribution of BLA→NAc projections, a cohort of rats underwent ablation of this projection as described above. Injection of DIO-DTR into BLA and AAV6-Cre into NAc resulted in expression of DTR-FLAG in a subset of BLA neurons (Fig. 4A,B). Immunohistochemical methods were used to verify location and spread of viral expression (Fig. 4B). Similar to mPFC→BLA animals, DIO-DTR expression was typically visible in the BLA from ∼AP −1.8 to −3.5, with strongest expression at AP −2.8. Quantitative analysis of immunofluorescence in BLA revealed that DT administration reduced the percentage of FLAG expression (Fig. 4D; t(11) = 6.239, p < 0.001) and FLAG cell counts (saline mean = 23.5, DT mean = 2.1; t(11) = 4.782, p = 0.001), with no difference in GFP expression (saline mean = 160.0, DT mean = 185.3; t(11) = −1.985, p = 0.082). Ablation of NAc-projecting BLA neurons disrupts extinction of alcohol seeking. A, AAVrh10-DIO-DTR was injected in BLA and AAV6-Cre was injected into NAc. B, FLAG-positive neurons (red) in the BLA expressing DTRs and projecting to the NAc. C, Extent of viral expression. D, DT administration decreases percentage of FLAG+ expression. Animals receiving saline or toxin showed no difference in lever pressing (E) or magazine entry (H) on the last 3 d of self-administration. During extinction training, both groups showed similar extinction of lever pressing (F), but toxin-treated animals showed a resistance to extinction of magazine entries (I). Both groups of animals reinstated lever pressing (G) and magazine entry (J) in response to presentation of the alcohol-paired cues. (n = 6/group; *p<0.05; **p<0.001). All animals in the BLA→NAc group acquired self-administration of alcohol as expected (Fig. 4E,H; F(19,190) = 3.072, p < 0.001), with no effect of future treatment (effect of drug n.s. : F(1,10)=0.229, p = 0.642; day × drug n.s. : F(19,190) = 0.716, p = 0.799). As with previous groups, there was also no effect of treatment on the extinction of lever pressing (Fig. 4F; main effect of day: F(4,40) = 36.903, p < 0.001; effect of drug n.s. : F(1,10) = 0.249, p = 0.629; day × drug: n.s. : F(4,40) = 1.171, p = 0.338). However, when we examined magazine entries across extinction training, we found an interaction between treatment and training day (Fig. 4I; day × drug interaction: F(4,40) = 4.106, p = 0.007; main effect of day F(4,40) = 8.953, p < 0.001; effect of treatment n.s. : F(1,10) = 1.905, p = 0.198). Follow-up independent-samples t tests revealed no effect of drug on magazine entries during days 1–3 of extinction training (p > 0.23 for each day), but toxin-injected animals showed, on average, more magazine entries on day 4 (t(10) = −2.361, p = 0.040) and day 5 (t(10) = −2.715, p = 0.022). 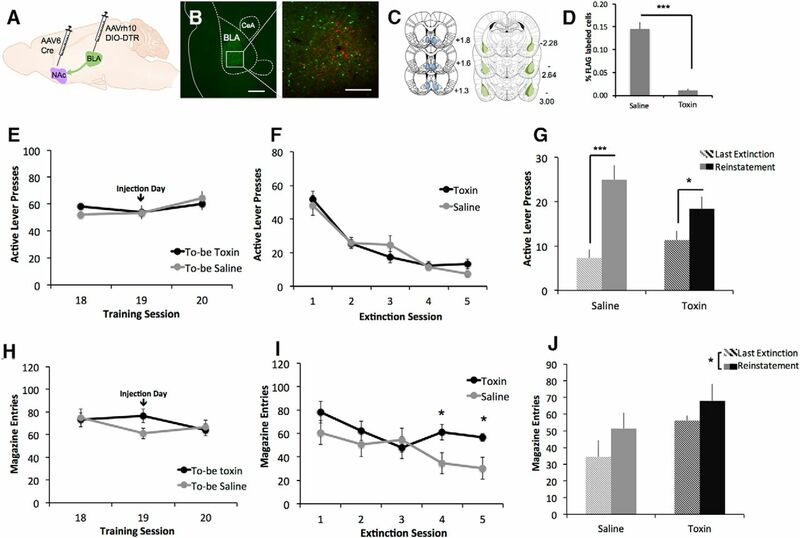 These results suggest that ablation of the amygdala-striatal pathway disrupted the ability of rodents to extinguish approach behavior to the area of alcohol delivery. After extinction, all animals were tested on cue-induced reinstatement. Here, we found a main effect of test session (Fig. 4G; F(1,10) = 46.245, p < 0.001), no main effect of treatment (F(1,10) = 0.667, p = 0.918), and a significant session × treatment interaction (F(1,10) = 5.004, p = 0.049). Follow-up paired-sample t tests showed that both groups of animals pressed significantly more during the reinstatement session versus the last day of extinction (saline: t(5) = −6.745, p = 0.001; toxin: t(5) = −3.073, p = 0.028). These data suggest that, although both groups reinstated lever pressing, the degree of reinstatement was greater in saline- versus toxin-treated animals. When we examined reinstatement of magazine entries, we found that there were main effects of day (Fig. 4J; F(1,10) = 7.400, p = 0.022) and drug (F(1,10) = 4.991, p = 0.049), with no day × treatment interaction (F(1,10) = 0.276, p = 0.611). Together, these data suggest that ablation of the BLA→NAc pathway resulted in elevated magazine entries overall, but both groups showed an increase in magazine entries in response to the alcohol-paired cues. Here, we investigated how precise cortico-limbic-striatal projections regulate extinction and reinstatement of alcohol seeking. To accomplish this, we implemented a combinatorial viral approach to express DTRs in specific projections among mPFC, NAc, and BLA. This strategy rendered the targeted pathway subject to ablation by systemic injection of DT while sparing other cortico-limbic-striatal projections. After viral infusions, we trained rats to self-administer alcohol and then tested the effect of ablating each projection on our behavioral model of alcohol seeking. We found that ablating mPFC projections to NAc, but not to BLA, blocks cue-induced reinstatement of lever pressing for alcohol. Ablating the BLA to NAc pathway disrupts extinction of approach for alcohol, as measured by magazine entries, and attenuates reinstatement of lever pressing. Together, these data provide insight into the neural control of alcohol seeking and suggest that the NAc acts as an integrator of motivational signals from the mPFC and BLA. To achieve ablation of specific pathways, we developed a viral approach combining an AAVrh10 construct encoding Cre-dependent expression of DTR-FLAG with a retrogradely transported AAV6-Cre construct. Because DTR expression is Cre dependent, it is restricted to cells projecting from the site of the AAVrh10-DIO-DTR-FLAG infection to the site of AAV6-Cre infection. Therefore, injection of the DTR-expressing virus into mPFC and AAV6-Cre into NAc induced expression of DTR-FLAG only in mPFC neurons that project to NAc. Immunohistochemical staining allowed us to label the targeted circuits and confirm that intraperitoneal DT injection resulted in dose-dependent ablation (Fig. 1B,C). Staining with a cleaved caspase-3 antibody further confirmed that DT injection induced apoptosis at 48 h after injection (Fig. 1E,F). Previous studies have used selective expression of DTR as a method for killing populations of neurons defined by their neurochemical phenotype or spatial location (Gropp et al., 2005; Carter et al., 2013; Xu et al., 2015). Our methodology expands on previous techniques to ablate neurons in a structure that project to a distinct target site, thereby killing these neurons in a directionally specific manner. Importantly, the combinatorial approach also allows for temporal control because DT can be injected at any behavioral time point. Because rats are not sensitive to DT (Coca et al., 1921; Middlebrook and Dorland, 1977; Naglich and Eidels, 1990), we did not include a group to test the behavioral effects of DT injection absent expression of DTRs. However, previous work demonstrates that DT administration in normal rodents, even at higher doses than the one used in this study, does not affect health or behavior (Gropp et al., 2005; Han et al., 2009). In addition, the null effect of DT injection in the mPFC→BLA group demonstrates indirectly that toxin alone does not affect behavior. Other studies have accomplished directionally specific chemogenetic inhibition using floxed DREADDs instead of floxed DTR (Carter et al., 2013; Kerstetter et al., 2016). Although a DREADD-based method allows for reversible neuronal inhibition, titrating CNO dosage can be difficult and repeated intraperitoneal injections of CNO can introduce stress that might interfere with behavior. Nonetheless, excitatory DREADDs could be used to examine activation of cortico-limbic-striatal circuits in alcohol seeking. Although ablation of the mPFC→NAc pathway did not affect extinction (Fig. 2B), there was a loss of cue-induced reinstatement in toxin-injected animals (Fig. 2C). Further, we saw that neurons expressing DTR were active during cue-induced reinstatement (Fig. 2E), confirming that the expression of these receptors did not interfere with neuronal activity. This is a novel and robust demonstration that mPFC projections to NAc are necessary for cue-induced reinstatement of alcohol seeking. Our data are consistent with experiments showing the following: (1) mPFC and NAc are activated by exposure to alcohol-paired cues after extinction (Dayas et al., 2007); (2) inactivating NAc attenuates cued alcohol seeking (Chaudhri et al., 2010; Millan et al., 2015); and (3) inactivating mPFC does not disrupt expression of extinction (Willcocks and McNally, 2013). They are also consistent with work showing that inhibition of mPFC→NAc, and the prelimbic to core subcircuit in particular, attenuates reinstatement of cocaine seeking after extinction (Kerstetter et al., 2016; Stefanik et al., 2016). In a separate set of experiments, we tested the effects of ablating mPFC neurons projecting to BLA. Here, we found no effect of ablation on either extinction or reinstatement (Fig. 2E,F), suggesting that mPFC afferents to BLA are not required for these behaviors. Combined with our initial experiments, these data suggest a dissociation of mPFC function in this context. Specifically, mPFC neurons that project to the NAc are necessary for cue-induced reinstatement of alcohol seeking, whereas those that project to the BLA are not. Other experiments have shown that the BLA is an important regulator of alcohol seeking in response to conditioned cues and contexts (Chaudhri et al., 2013; Sciascia et al., 2015). However, whereas the function of mPFC neurons that project to the BLA has been examined in the context of food seeking (Petrovich et al., 2005; Land et al., 2014), a role of this pathway in alcohol seeking has not been investigated directly. There is evidence that the mPFC-central amygdala pathway is important for regulating alcohol intake (George et al., 2012) and our data may indicate that projections to the BLA are functionally distinct in this regard. In addition, there is an emerging literature demonstrating that neuronal ensembles in mPFC and amygdala regulate alcohol seeking and taking (Pfarr et al., 2015; de Guglielmo et al., 2016). Our data complement this approach and could suggest that the effects of these ensembles are mediated by their downstream targets. In addition to their interactions with the mPFC, BLA and NAc are also connected by a strong glutamatergic projection. This projection has been studied extensively in the context of motivated behaviors and is believed to be important for responding to reward-predictive cues (Cador et al., 1989; Stuber et al., 2011; Stefanik and Kalivas, 2013; Wassum and Izquierdo, 2015). In the domain of alcohol, there is evidence suggesting that the BLA→NAc pathway plays a role in both inhibition and seeking (Millan and McNally, 2011; Sinclair et al., 2012; Millan et al., 2015). Indeed, our data show that ablation of this projection affects both extinction and reinstatement. In particular, we found that BLA→NAc ablation results in a resistance to extinction of approach for alcohol as measured by head entries in the magazine port (Fig. 4F). This effect did not appear until day 4, which may suggest that ablation interferes with late-stage but not early-stage extinction. Interestingly, there was no effect on extinction of lever pressing (Fig. 4E), indicating that projections from BLA to NAc regulate extinction of approach but not instrumental responding. Further, our data show that ablating BLA→NAc attenuated reinstatement of lever pressing, although it did not affect reinstatement of magazine entries. This is consistent with previous findings that the circuit regulates cue-triggered appetitive responding for sucrose (Stuber et al., 2011) and cocaine (Stefanik and Kalivas, 2013) and that glutamate levels in these structures are elevated in alcohol seeking (Gass et al., 2011). Although our data demonstrate that mPFC and BLA input to NAc regulate alcohol-seeking behaviors, an important constraint is that we did not dissociate between subregions of the NAc (i.e., the shell and core). In the context of cocaine intake and other motivated behaviors, there is strong evidence showing that infralimbic projections to the shell regulate extinction and prelimbic projections to core regulate reinstatement (Peters et al., 2009; Gourley and Taylor, 2016). Although these circuits have not been explored as fully in alcohol-seeking paradigms, recent studies demonstrate that the infralimbic cortex may serve a similar, inhibitory role that facilitates extinction of alcohol seeking (Barker et al., 2012; Pfarr et al., 2015), perhaps through projections to the shell (Meinhardt et al., 2013). Similarly, there is evidence that BLA projections to the core versus the shell may regulate reward seeking differentially (Millan and McNally, 2011; Stefanik and Kalivas, 2013). Future experiments could be conducted to ablate these subcircuits separately and test the effect on extinction and cued reinstatement. In addition, cell-type-specific circuit-level mechanisms of mPFC→NAc regulation of cue-induced reinstatement are warranted after reports suggesting the involvement of μ-opioid and D1 dopamine receptors in the reinstatement of alcohol seeking behaviors (Chaudhri et al., 2009; Perry and McNally, 2013). Furthermore, we targeted the anterior BLA and did not include subjects with significant viral expression beyond AP coordinate −4.0. Given evidence for a functional distinction of anterior and posterior BLA in cue-motivated behavior for both alcohol (Millan et al., 2015) and cocaine (Kantak et al., 2002), future experiments could investigate the effects of disconnecting mPFC and striatum from more posterior regions of basal amygdala. In summary, we have demonstrated the feasibility of ablating specific populations of neurons based on their projection targets. Using this strategy, we demonstrate that different inputs to the NAc serve distinct roles in alcohol-seeking behavior: mPFC neurons projecting to NAc but not BLA are necessary for cue-induced reinstatement and BLA neurons projecting to NAc are necessary for both extinction of approach and for regulating reinstatement (Fig. 5). These data provide potential insight into findings from the clinical literature showing increased mesocorticolimbic activation to alcohol-paired cues in alcohol-dependent individuals (Heinz et al., 2009; Bühler and Mann, 2011). They are also consistent with the finding that striatal glutamate levels are upregulated in recently detoxified patients (Bauer et al., 2013) and could suggest that glutamatergic projections from mPFC supply this tone. Further, our finding that BLA→NAc regulates extinction could suggest that signals from mPFC and BLA are integrated in NAc to guide seeking behavior. In conclusion, these results further our understanding of the precise neural control of alcohol seeking and could help to inform the future development of more targeted pharmacotherapeutics for these disorders. Hypothesized role of circuitry mediating extinction and reinstatement of alcohol seeking. Our data suggest that projections from the mPFC to the NAc, but not to the BLA, are necessary for cue-induced reinstatement of alcohol seeking. Neurons projecting from the BLA to the NAc regulate both extinction and reinstatement of these behaviors. This work was supported by the National Institutes of Health (Grant MH091861 to C.P., Grant DK098994 to R.J.D., Grant AA012870 to J.R.T., and Grant AA024673 to C.R.K. ); the Allison Family Foundation (C.P. ); and the Connecticut Department of Mental Health and Addiction Services. We thank Meiyu Xu for generating the DTR virus, the UPenn Vector Core for generating the AAV6-Cre virus, and Ben Land for helpful discussions and insights. (1921) The reaction of the rat to diphtheria toxin. J Immunol 6:387–398. (2007) The rat brain in stereotaxic coordinates, 6th edn. Burlington: Elsevier Academic Press. Substance Abuse and Mental Health Services Administration (2014) Results from the 2013 National Survey on Drug Use and Health: summary of national findings. Available from: https://www.samhsa.gov/data/sites/default/files/NSDUHresultsPDFWHTML2013/Web/NSDUHresults2013.pdf. Accessed: September 1, 2016.